10 years ago when I have attended the 10th year publication of the Philippine Community Herald Newspaper which was held at the Burwood RSL Club NSW in Sydney’s metropolitan suburb in February 6th 2004. It was also the PCHN publisher’s 50th birthday which was well attended by her close friends and all the contributing writers and members of The Filipino – Australian media. I remember my friend Tess Stephens from NSW Central Coast and my late beloved mother Jovita were with me to attend this milestone. I am so thrilled that at long last I am able to practice my passion for journalism as I have graduated with the degree from Lyceum of the Philippines in 1980. Although, I chose to become a high school teacher after graduation but it never diminished my passion for the media. I am so honoured and thankful that Evelyn Zaragoza have trusted and given me the break inspite of my lack of exposure in the media, Evelyn have encouraged me to contribute in our community newspaper which started in Sydney, NSW. As the cliché goes and the rest is History. The Filipino Australian community in Bundaberg, Queensland is already in full swing planning for their 30th year Foundation Day this coming June 14th 2014. It will be the very first time that the Filipino community will level-up with the rest of Filipino Australian community organisations all over Australia to hold their 30th year Foundation year and at the same time Philippine Independence Day celebration at the Civic Centre in Bundaberg, Queensland. 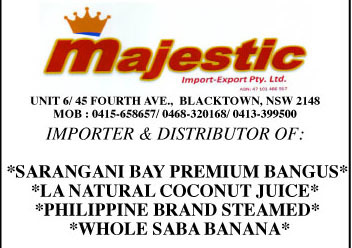 The Filipino migrants is one of the largest migrant group that settled in the Wide Bay Bundaberg region. It will also highlight the Pearl of the Orient theme and the Sagala. (a parade of Filipino men and woman in their Filipiniana outfit. There will also be for the very first time a drama presentation by the youth about the life of our national hero Dr. Jose P. Rizal which is being research and performed by well known Filipino youth in Bundaberg Star Radel & her friends from her school North Bundaberg High School, she is the only daughter of Rowena Radel BDAFAI community liaison officer. Teofila “Fely” Refulle Cayao Hunter came to Bundaberg in 2010, a widow for almost 10 years and have met her Australian husband Ned Hunter ( born in Newcastle, NSW) and moved to Queensland in the early 1970s. Sis Fely have worked in the Philippine Army for in the administrative office for 36 years. An accomplished mother and having been widowed after 25 years of marriage was an exceptional woman who was able to send all her children to school and eventually finished their college education thus landing all her children in their respective very good career. Her 2 sons were holding a high position in a Cruising liner ship. Her only daughter is a physical therapist. Sis Fely was shocked when she found out that she have breast cancer (invasive carcinoma) which will require one of her breast to be removed to prevent from her cancer spreading. The surgery was successful and she is now recuperating. Her only daughter Joyce will be taking care of her after the surgery. Sis Fely have also been in the El Shaddai Charismatic ministry and served as a coordinator in Carmona, Cavite where her family resides. Sis Fely is also in the charismatic El Shaddai ministry in Bundaberg. This is an apostolate to deepen our belief n our Catholic faith and also a way of fellowship to all people for Filipinos and the any community in Australia. The International Women’s Society Benefit Concert for Typhoon Haiyan Yolanda Victims in the Eastern Visayas Philippines. The IWS in Bundaberg were presenting a benefit concert for the Typhoon victims of Typhoon Haiyan “Yolanda’ on February 15th 2014 Saturday. The concert is composed of the different performers in the Wide Bay and Bundaberg region. The IWS is a multicultural group of women a social non- profit organisation for women of different socio-cultural background who get together and just have fun and be able to assimilate and be proud of themselves cultural identity. Different performer songs, dances both cultural and modern will be performed on stage at The Moncrieff Theatre in in Bundaberg. The IWS president Norma Luz S. Jensen with the support of the Bundaberg Regional Council, Bundaberg Mayor His Honourable Mal Forman, and other will be supporting this charity event. Dympna Escober Kimmorley OAM one of the pioneering Filipino community leader in Bundaberg have started a social group recently for the Over 60’s - The Young Once. The Filipino social group known as the Over 60’s- The Young Once held their Christmas break-up last December 21st, Saturday at Mr. & Mrs Ken Cogzell residence. The sumptuous dinner was prepared by the ladies showcasing the Filipino cuisine adherent to the occasion. After lunch entertainment was followed first by singing their theme song The Young Once, then hip hop, cha cha and line dancing followed. The party winded by karaoke singing. There was an exchange gift and prizes was given to the best performer. Their next event will be in February. The venue will soon be announced. Bundaberg city is such a contrast. After nearly 8 years of moving to this Queensland Regional city I have noticed so many changes. The first thing that struck me was the wide open space and the thousands and thousands of acres of sugar cane plantations, macadamias, and all sorts of fruits and crops. I am in awe to see different faces from different countries and I found out hundreds of backpackers all over the world come to have working holiday to Bundaberg. Young Filipino families most of them skilled in their own profession such as nurses, doctors, welders professionals and skilled workers come to Bundaberg and have settled here. Last Australia Day January 26th a few Filipino migrants and families sworn in as naturalised new Australian citizens. There is no doubt the Facebook, Instagram, Twitter and others is really a part of our modern lives now. Recently, I have reunited with my former colleague in the teaching profession in the Philippines Nieva Cenera Celaya now Hagemann. Nieva and I were former English teachers in high school at Meycauayan College in Meycauayan, Bulacan. This is one of the many reunions I have ever since I have been on the social media Facebook. Several of my former classmates from Elementary, High School and University suddenly we found each other after so many long years of not keeping in touch have all appeared on this social media. I have never thought that some of them also migrated to Australia just liked me.